With lots of new information recently, it has been hard to stay on top of what is where on the old “Etteilla Timeline and Variants” thread. So I’ve been working on an updated timeline that gives links to sources and to where those particular sources have been discussed, including other threads, 10 or 12 of them. So if you know roughly the year for something Etteilla-related, you can go to that year, which will have enough links to get to where you want to go. I have tried to give enough information to enable one to find another link in case the one you want becomes broken. (a) 1738-1783. This is mostly old material, but filled out with links. I will try to update periodically. PM me if I don’t. Likewise if you see an error on my part. That would cut down on unnecessary posts. If you aren't satisfied with my response, or lack of response, then by all means write a post. And of course do so if you have new information, or something to discuss. I will also try to add a some illustrations. Before 1738. For 16th century Italy, 16th-17th century Spain especially, see Ross Caldwell at http://www.academia.edu/6477311/Brie..._of_cartomancy and here at http://www.tarotforum.net/showthread.php?t=115111. For a timeline of other early uses of playing cards for fortune-telling, especially England starting 1620, see https://marygreer.wordpress.com/2008...playing-cards/. 1738. Jean-Baptiste Alliette born (per burial certificate, which says he died 12.12.1791 at age 53), by his account (at end of Zodiac Mysterieux, 1772) on 1 March, in Paris (in Lettre sur l'Oracle du Jour, 1772), all per Decker, Depaulis, and Dummett [DDD], Wicked Pack of Cards 1996, p. 76), son of a caterer (“maitre rotisseur,” DDD p. 77) by the same name. Before 1750. Divination with tarot cards is recorded in a manuscript of Bologna, Italy, It uses 35 of the 62 cards of the Bolognese Tarocchini deck, divided into 5 piles of 7 cards each, with short divinatory meanings listed for each of the 35. The manuscript was discovered by Franco Pratesi, whose article is at http://trionfi.com/pratesi-cartomancer (for the specific topic, go to “cartomancy list”). In 1750, the art of drawing cards was unknown in France; but in 1751, 1752, and 1753, three elderly people worked at drawing them. They were right, although having shuffled and cut a deck of 32 cards, they read the cards one by one; and when the Enquirer had drawn a sword, that [these old people alleged] announced sorrow; likewise hearts foretold happiness, diamonds the country [la campagne, mistranslated as “campaigns” in the English translation] and clubs money. Fanaticism cried sacrilege, and in order to save these alleged sorcerers from the devouts, they were locked up, without being listened to, in Bicetre or the Salpetriere. As DDD note, the characterization of the suits is the same as de Mellet’s in 1781. The Bicetre was one of the places where the Marquis de Sade later was sent (http://en.wikipedia.org/wiki/Bic%C3%AAtre_Hospital ). The Salpetriere was a prison for prostitutes, the mentally disabled, the criminally insane, and the poor (http://en.wikipedia.org/wiki/Piti%C3...%A8re_Hospital). From 1753, our savant renovated cartomancy by throwing out the art of drawing the cards one by one and replacing it with the art of reading the cards on the table as a whole. ... In giving the way of reading the significance of the cards, our author from 1753 wrote up not only the false meanings given each in their own way by the three elderly people but also gave the legitimate meanings, taking that of victory for the 9 of hearts, which was wrongly allocated to the 9 of diamonds by one of the three people, etc. The art of drawing cards, according to Etteilla, could not be as modern as an invention as French cards. With the backing of ancient manuscript, he thought it came from the 33 sticks of a Greek, who used them in Gaul to pronounce oracles and had taken or naturally had the name Alpha. Etteilla allowed him [the editor] to reprint this ‘petit amusement’, since he had ‘given this method of reading the cards when he was 15 or 16 years old, and having verified it just at 33.’ Researches have failed to discover such a book, and we must note that Etteilla himself never mentions any work printed in 1771 or 1772. But 22 years is exactly Etteilla’s age in 1771, who actually ‘was 15 or 16 years old’ in 1753. DDD think that what follows in the “an V” book, the “short work of some folios” is in fact the “Abrege de [Synopsis of] Cartomancie” of 1753. Whether it is the same as what appears in the modern LWB’s explanation of cartomancy is not clear. Only one section, called “Fragment d’Etteilla” (pp. 38-55 of modern LWB), is actually attributed to Etteilla. It says nothing about how to read the cards; instead, it is a very general account of the significance of card-reading in relation to the conduct of one’s life. Also, Etteilla does not claim that either this 1753 work or the 1757 that followed existed in a printed edition. In fact, Etteilla or his follower speaks of the “tyranny” that existed then, with its arrests and imprisonments (LWB p. 10). In 1770 he “opposed himself to the ignorance of fanaticism with as much force as reasoning and skill”. 1770 would seem to be the year of Etteilla’s first printed book, for which see entry 1770 below. “Fates of the Saints” probably refers to one or more books of oracles that are selected by means of dice, each related to a particular saint. It is the medieval adaptation of earlier works in Latin and Greek that related various gods to each piece of advice. As to the “Piedmontese”, Etteilla says more about him in the 2nd Cahier, pp. 134-136. He was named Alexis, whom he met in Lamballe, Brittany. This Alexis, he tells us, was the grandson of “Alexis called Piémontese”. For the translation of this passage, see http://www.tarotforum.net/showthread.php?p=2805500 post 130. “Alexis Piémontese” was the pen-name of an Italian physician, generally assumed to be Girolomo Ruscelli, (1520-1566), who was most famous for a book of remedies still in print in the 1790s, per Wikipedia (https://en.wikipedia.org/wiki/Alexius_Pedemontanus). 1759. Two women in Marseille are sentenced to 8 days in prison for because they had “taken advantage of the simple-mindedness of several people and took money from them under the pretext of finding for them things stolen or lost, by the means of some packs of cards” (Ross Caldwell at http://www.academia.edu/6477311/Brie..._of_cartomancy). 1762-1763. Oliver Goldsmith mentions fortune-telling with cards, see Greer timeline, above. 1763 and after. Cartomancy in Germany. see http://tarotforum.net/showthread.php...highlight=1752 and Mary Greer timeline, top of post, from Goethe. 1763-1767. Etteilla has at least one child, Louis-Jean-Baptiste, the only child mentioned in his 1791 death certificate (DDD p. 76). The son is called a “merchant grocer” there. 1765a. "The Oracle, a pack of Cards” advertised in The Public Advertiser, London; see Mary Greer timeline, also for England entries 1791, 1796. Xanthippe was the wife of Socrates, who Xenophon's Symposium characterized as "the hardest to get along with of all the women there are" (http://en.wikipedia.org/wiki/Xanthippe). From 1768-69. Alliette engages in print selling, mentioned as such in a 1797 bibliography of current French literature, ‘Alliette, by anagram Etteilla, Print seller in Paris”. In 1768, three thieves steal some books and prints. Alliette's shop was inspected on 11 March 1769 and found to have some of the stolen prints. Alliette was proved innocent of wrongdoing (DDD p. 80). 1770a. Etteilla publishes Etteilla, ou maniere de se récréer avec un jeu de cartes par M*** (Etteilla, or a Way to Entertain Oneself with a Pack of Cards by Mr***) . It includes both upright and reversed meanings for a deck of 32 cards, plus a 33rd card, blank, called “Etteilla”. At the end he mentions ”les Taraux” in a list of methods of fortune-telling (DDD, p. 83). The book is reviewed in a couple of established journals. 1771. A “short work of some folios which appeared at the end of the year 1771, under the title of Le Petit Etteilla”, as reported by its reprinting editor in “an V” (1796) (DDD p. 98). No record has been found of such a book, nor does Etteilla ever refer to such a thing otherwise, according to DDD. They speculate that it might be the “Abrege” of 1753 referred to in the 1791 publication, reprinted 1796 changing the spelling of “cartonomancy” to “cartomancy”. With creditors pressing, the couple hastily caught a boat to Calais on 15 September 1772. ...Giuseppe was funded to set up a laboratory where he happily tried out the experiments from a sixteenth century book he’d acquired. It was Alesso Piémontese’s Secretes admirables, one of the most comprehensive occult manuals ever written, setting out detailed prescriptions for making paints, inks, medicines, cosmetics, and magical spells. McCalman unfortunately does not cite his source, unless it is Photiedes, Les Vies de Cagliostro, p. 101f, his only reference for this period. Alexis, of course, was the first name of the “Piémontese” Atteilla claimed taught him about the tarot. 1772a. A small work, Lettre sur l’oracle du jour, gives, under the signature of one ‘Duchesse de ***, a flattering portrait of Etteilla (DDD, p. 79). 1772b. Etteilla publishes Le zodiac mysterieux, ou les oracles d’Etteilla (The mysterious zodiac, or Etteilla’s oracles). It is a collection of astrological predictions. According to a study by Halbronn in 1993, it was not real astrology (DDD p. 79). This work in an 1820 reprint by Gueffier jeune [the younger], rue Bourtebourg no. 12 (?) is digitalized at http://gallica.bnf.fr/ark:/12148/bpt6k622696.r=Etteilla. The 1772 frontispiece is at https://upload.wikimedia.org/wikiped...?1451519737126 (which I get from http://www.wikiwand.com/it/Etteilla). 1775. In England, S. Hooper, according to the name on some of the cards, makes a deck with many of the motifs found later in the c. 1790 deck and others (http://tarotforum.net/showpost.php?p...3&postcount=85)--and also earlier, i.e. the Minchiate Francesi. English works on playing cards were popular on the Continent, due to the popularity of Edmund Hoyle’s works, translated into French in 1761. For earlier English divinatory decks and uses of playing cards, see https://marygreer.wordpress.com/2008...playing-cards/. 1776. Alliette’s shop advertises in a directory. It says that he has traveled widely in the Provinces. (DDD p. 81) See also http://bibliotheque-numerique.inha.f...ontees-sous-v/, an advertisement of prints for sale by Etteilla. 1779-1780. In 1779, Cagliostro introduces his “Egyptian Rite” in Mitau (in what is now Latvia), from material gathered in London (an alleged manuscript by "Cofton," possibly, per McCalman p. 41, a "minor Oxford scholar of eastern religion named George Costard”), Leipzig (from Dom Pernety), etc. Then does the same in St. Petersburg, Warsaw, and elsewhere, healing the sick and conducting seances. Sept. 1780, Cagliostro arrives in Strasbourg to much publicity, continuing to heal and gain adherents. (Source: Roberto Gervaso, Cagliostro, pp. 69, 82, 92; confirmed in McCalman.) Cagliostro’s popularity could have influenced Etteilla. Pernety is an alchemical writer referred to by Etteilla in his 2nd Cahier, 1785. 1781. Publication of vol. 8 of Le Monde Primitif by Court de Gébelin, claiming an Egyptian origin for tarot (essay on tarot uploaded at http://www.tarock.info/gebelin.htm; translated in Rhapsodies of the Bizarre, by J. Karlin). De Gébelin clams that the images reflect Egyptian ideas and allegories, and so constitute an “Egyptian Book,” just as Etteilla will two years later. The volume also includes an essay by le Comte de M*** [de Mellet] (same website and book), who goes so far as to call the tarot cards “The Book of Thoth,” just as Etteilla will, consisting of hieroglyphs and describing Thoth’s teachings on cosmogony, i.e. on the origins of the universe. For de Mellet the trumps start with the 21st card and proceed downwards. Etteilla will similarly start his sequence with four of the last five trumps, in his case identifying them with four of the first six days of creation in Genesis. The title that won acceptance was Manière de se récréer avec le Jeu de Cartes nommées Tarots. And despite Etteilla’s protests, his word “cartonomancy” was soon replaced by its derivative, the equally new word “cartomancy,” first proposed by one of his students in 1789 (DDD p. 99). 1783b. An additional possible publication is L'Homme à projets, which Etteilla said in 1791 was first published this year, and which he was reissuing to show the accuracy of its predictions. Timeline II continued from preceding post: 1784-1791. 1784b. Jacques Grassett Saint-Sauveur (1757-1810), French diplomat and author (on his life, thread http://www.tarotforum.net/showthread.php?t=248670), participates in a book series 1784-1788, Costumes Civils actuels de tous les Peuples connus. It was dedicated to "Charles-Eugene-Gabriel de La Croix, Maréchal de Castries, Comte d'Alais, premier Baron des Etats du Languedoc, Ministre d'Etat", who was "secrétaire d'État à la marine” (Secretary of State of the Navy) 1780-1787 (http://www.tarotforum.net/showpost.p...30&postcount=3 , https://fr.wikipedia.org/wiki/Charle...ix_de_Castries). The de La Croix family came from Montpellier, as did Grasset Saint Sauveur's. This project puts Saint-Sauveur, who will publish 20 books as well as decks of divination cards, in the company of high government officials, perhaps including de La Croix’s friend the wealthy Jacques Necker, retired in 1781 as France’s Director-General of Finances, returnng in 1788 and becoming Finance Minister July 1789 - Sept. 1790 (http://www.newworldencyclopedia.org/...Jacques_Necker). From 1788, such officials will include François-Emmanuel Guignard de Saint-Priest (1735 – 1821), associated with a divinatory deck of c. 1790. See http://www.tarotforum.net/showpost.p...&postcount=387. 1785b. Etteilla publishes Fragment sur les hautes sciences, suivi d’une note sur les trois sortes de medicines donnees aux hommes (Fragment on the High Sciences, followed by a note on the three kinds of medicines given to men) (DDD p. 84). 1785c. 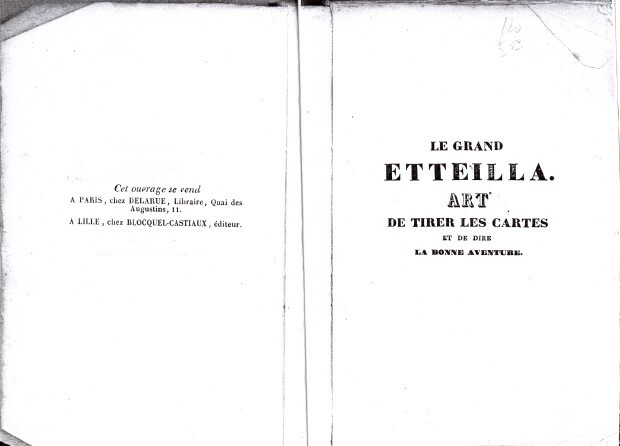 Etteilla publishes his 4th Cahier (with Fortitude as frontispiece) and its Supplement. These have been reprinted in Jacques Halbronn’s L’Astrologie du Livre de Thot (1785) Suivis de Recherches sur l’Histoire de l’Astrologie et du Tarot, Paris 1993. In the 4th Cahier he sets up correspondences between the 12 signs of the zodiac, in order starting with Aries, with the first 12 of his trumps. He also has the 10 Coin pip cards correspond to the 7 planets plus head and tail of the Dragon and Part of Fortune. Attributes these assignments to the Egyptians (DDD p. 87). The 4th Cahier Supplement in part is an addition to the 3rd Cahier. That part is online with translation at http://www.tarotforum.net/showthread.php?t=185573 and http://thirdcahier.blogspot.com/2012/10/blank_239.html. 1785e. Etteilla publishes Philosophie des hautes sciences, ou la clef donnée aux enfans de l’art, de la science & de la sagesse (Philosophy of the high sciences, or the key given to children of art, science and wisdom) (DDD p. 84). 1786. Etteilla publishes Supplement au deuxième cahier, ou mieux cinquième livre des tarots (Supplement to the 2nd cahier, or better 5th book of the tarots). (DDD p. 84). A short selection, with translation, is posted at http://etteillastrumps.blogspot.com/...as-whole.html; find “161”. c. 1786. A treatise on alchemy: Les sept nuances de l’oeuvre philosophique-hermétique, suivies d’un traité sur la perfection des métaux (The seven grades of the philosophical-Hermetic work, followed by a treatise on the perfection of metals). “Historians of alchemy regard Etteilla’s book as the last alchemical treatise of the classical period” (DDD p. 88; they cite the 20th century writer Conseliet). 1787b. Etteilla invited to speak to the “Philelethes,” which had been founded in 1775 as a Masonic-like secret society. Etteilla in his Treatise on the Perfection of Metals had said he had the highest regard for “true Masonry,” but “All the little denominations of lodges and grades announce folly more than wisdom.” (DDD p. 89). 1787c (end). Melchior Montmignon d'Odoucet is “recommended” to Etteilla as a student. (DDD p. 104, quoting Etteilla’s 1790 Apperçu..; see entry 1790d below). His studies proceed in 1788. 1788c. Hisler visits Etteilla in Paris (Decker p. 191). 1788d. Pierre Joseph Joubert de La Salette (1742-1833), an army officer stationed in Grenoble, contacts Hugand and de Bonrecueille in Lyon, joins Etteilla's group (Decker p. 192). 1788e. Date that Albert D’Alby says his L'Oracle parfait, ou nouvelle manière de tirer les cartes, au moyen de laquelle chacun peut tirer son horoscope” was approved by the censor; online at https://books.google.de/books?id=nmV...gbs_navlinks_s. discussed at http://tarotforum.net/showpost.php?p...30&postcount=1 and http://tarotforum.net/showpost.php?p...&postcount=333 Mentioned by DDD p. 146 and note 8, p. 282. It uses three 36 card decks, each 32 + four special ones. See also entry 1802, the year of publication and the first date actually known. In the same year is Etrennes nouvelles de l'horoscope de l'homme et de la femme By M. G. D. R., published by G. Quinet, using an expanded piquet set of 36 cards, online at https://books.google.co.uk/books?id=...page&q&f=false. 1789a. Etteilla applies for a “general” patent to print his deck on 19 Jan. 1789, granted 5 Feb. 1789, registered on 13 March (DDD p. 92). A 4 page pamphlet entitled “Livre de Thoth” dated 1789 says, “See the Book of Thoth, which I am permitted to publish today, with the King’s appointment.” Also establishing Etteilla’s involvement with this deck are copies, made by their author, of letters written in Lyon by De Bonrecuille, one of the “interprètes.” On 27 November he writes to Etteilla: ‘I am very glad to hear that we will soon have the Tarot cards you have restored.’ Then on 14 March 1789: “We very satisfactorily have received the Tarot cards which you sent us...” (DDD p. 91) The keywords are those of the 3rd Cahier. In addition, Cards 2-5 each have the name and number of one of the 4 elements, not in sequence; cards 2-8 say which of the 7 days of creation, not in sequence, relates to the card. Unlike most later versions, there is no sunburst on card 1 and no clothing on the small figures in card 14. Cards 13-17 have extra numbers: a 14 on card 13, a 15 on card 14, a 16 on card 15, a 17 on card 16, and a 13 on card 17 (DDD p. 93). DDD say that according to the Dictionnaire Synonymique of 1790, they are "signs of death." 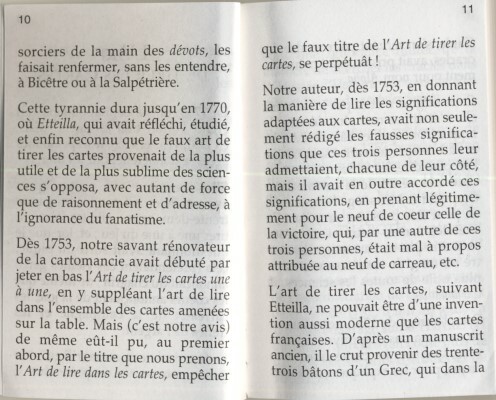 In the 2nd Cahier Supplement of 1786, Etteilla says of the double numbering on 13-17, that it indicates "the chain from birth to death" (p. 162: "la chaîne de la naissance à la mort"). For more details see http://www.tarotforum.net/showpost.p...&postcount=131. 1789b. In May, National Assembly declared, inaugurating the French Revolution. Bastille prison stormed 14 July, new government formed by Louis XVI July 16-19. 1789d. Etteilla in an advertisement of his work mentions that lessons are available from d'Odoucet as well as from himself (Decker p. 192). c. 1789 or later. The "Nouvel Eteila". A deck pf 32 cards with small inserts of playing cards at the bottom right, crudely added to the originals, plus 4 cards with “Eteila” in the corner instead (http://www.tarotforum.net/showpost.p...&postcount=381 ). According to the BM, which has a deck at http://www.britishmuseum.org/researc...=eteila&page=1, they are “late 18th“, “Anonymous”, and “36 cards”, On ATF they are at http://tarotforum.net/showpost.php?p...&postcount=346. “Late 18th century” is also the dating in an 1898 publication at http://gallica.bnf.fr/ark:/12148/bpt...%20Eteila.zoom, item 53, of a deck called the “Petit Oracle des Dames/Nouvel Eteila/Petit Necromancien” published by a “Mme. Finet”. The Rothschild Collection at Waddesdon Manor has an uncut identical to the cards of the BM deck except for added color; the sheet is labeled “Nouvel Eteila, ou le Necromancier” on the top right, no date (information from Philippa Plock at http://www.tarotforum.net/showpost.p...&postcount=350). The BnF attempts no dating for a “Nouvel Eteila ou le petit nécromancien” in their catalogue, at http://catalogue.bnf.fr/servlet/Rech...host=catalogue. Some of the imagery of the BM’s deck is very close to Etteilla’s tarots published 1789 (e.g. cards its 15, 16, 25, 34, 36). So either it is after then, or Etteilla’ tarot borrowed heavily from it (unlikely because the cards in question derive from prior French tarot, and the Anonymous is not a tarot). Other of its cards are similar to a c. 1790 66-card deck (see “c. 1790” entry). Many of the cards in the Anonymous are reversals of cards in the c. 1790 (or vice versa). Deck comparisons are in the first two posts of http://tarotforum.net/showthread.php?t=248830. The deck has 4 images found also in the 33 card version of a Saint-Saveur "geographic" deck, 3 of them reversed. These cards are dated "18th century" by the Metropolitan Museum, http://www.metmuseum.org/collection/...%89trangers%27, for more on which see "c. 1820" entry, the date of a 52+1 card version. The earliest verified date for a “Finet” is 1824, per Kwaw at http://tarotforum.net/showthread.php...24#post4547267, citing Depaulis personal communication 24 Dec. 2015. There is also a c. 1840 “Finet” in the Cary Collection (http://tarotforum.net/showpost.php?p...&postcount=331 and http://tarotforum.net/showpost.php?p...&postcount=337 ). A deck with the same title (Nouvel Eteila, ou le petit necromancien) but lacking the small cards in the corner also appear under the name of “Robert” in the Bibliographie de la France for March 1820 (https://books.google.co.uk/books?id=...44%2C79&edge=0, and in a BNF listing at http://catalogue.bnf.fr/servlet/Rech...host=catalogue . DDD (p. 144, citing in note 5 p. 282 Depaulis 1984, no. 133), had given a dating of c. 1810 to the same “Robert”, as did Depaulis in Tarot, Jeu, et Magie (http://www.tarotforum.net/showpost.p...7&postcount=18, per Kwaw). For another “Nouvel Eteila”, also a Petit Etteilla type, see entry 1791b. ...there a final footnote expresses negative feelings for two magi ‘living in France, one in Paris and the other in Lyons’.. It is easy to recognize Etteilla, and Hugand, his Lyonese disciple; ‘the first one a “half-savant” who is causing much trouble to science by stepping back from his sacred duties of a husband, of a father, etc., with impunity’, is accused of ‘real ignorance, concealed with much art.’ Hugand is ‘enthusiastic’, but ‘less skilled’. D’Odoucet also puts his name to a leaflet promoting a forthcoming journal; the leaflet ends “AMOUR POUR LE ROI,” i.e. Love for the King (DDD p. 104). 1790c. D'Odoucet publishes Revolution Francaise in Paris. It has a footnote critical of Etteilla and Hugand, but not mentioning their names. Etteilla is judged a neglectful husband and father, as well as a charlatan. Hugand is declared unskilled. (DDD pp. 103-104; for scans, see http://forum.tarothistory.com/viewtopic.php?f=11&t=827 . 1790d. 1 July. Etteilla founds, with his son, the “Nouvelle Ecole de Magie” (New School of Magic), on “le premier juillet de la seconde annee de la liberte francaise,” as a July 19 leaflet for a lecture announced: the first July of the second year of French liberty. The Ecole publishes Cours theorique et pratique du livre de Thot (In full: Theoretical and practical course in the book of Thoth, so as to understand correctly the art, science, and wisdom of giving oracles). 6 lessons are planned, but all copies have only 4 (DDD p. 95). Another book is “The Game of Tharaoth, following one of the ways of the first Egyptians.” Another is the Apperçu sur La Nouvelle Ecole de Magie (Prospectus on the New School of Magic), where he calls d'Odoucet "Dodo", which Decker (p. 196) says is equivalent to the infantile "goo goo" in English and not the name of the famously stupid bird. Etteilla attacks this disciple’s "despising tone" in one who “should have been grateful” for his master’s 35 or 36 years of studying (DDD p. 104). Another pamphlet, November, is “Oracle pour et contra mille sept cent dix-huite-onze [Oracle for and against 1791]”, seen at (http://gallica.bnf.fr/ark:/12148/bpt6k62271r.r=Etteilla). 1790d. De Bonrecueille, Hugand, and de La Salette have all begun to compile interpretations of individual cards. De Bonrecueille writes de La Salette: "Brother Hugand has indeed received your epistle on the synonyms of the Book of Thoth, but according to the announcement made by Monsieur Etteilla, we had presumed that you had composed something more complete about it" (Decker p. 197, from Amadou, p. 20). c. 1790. A 66 card hand-painted divinatory deck now in the BnF (http://gallica.bnf.fr/ark:/12148/btv...planchecontact) is produced, perhaps for a family member of François-Emmanuel Guignard de Saint-Priest; but it might have been for the court in his capacity as “Secrétaire d'Etat à la Maison du Roi”). Some designs later appear in "Petit Oracle des Dames" decks, combined with designs from Etteilla’s tarot; they are also, reversed, in the “c. 1789 or later” deck above. For the cards, see the first three posts of thread http://www.tarotforum.net/showthread.php?t=248520, additional comments in posts 4 and 5, more in other threads, e.g http://www.tarotforum.net/showthread.php?t=249766 and http://www.tarotforum.net/showthread.php?t=248670, with links. Here is a summary. Why Guignard, and when? Card 66 has a map of an area just north of the Danube River in what is now Rumania showing places where the Russian army scored key victories over the Ottomans in 1769-1770; Guignard was then the French ambassador to the Ottoman Empire (http://tarotforum.net/showthread.php?t=171379&page=6, posts 53, 55). Also, card 3 is the “Minister of the Interior”. The latter was an office created by the King on 7 Aug. 1790, (https://en.wikipedia.org/wiki/Fran%C...e_Saint-Priest), filled by Guignard until Jan. 1791 (compare the blue sash on the Wikipedia portrait with that on the card). But the handwritten “Ministre de l'Intérieur” on the card is on what looks like a piece of paper pasted on (http://www.tarotforum.net/showpost.p...59&postcount=4). Guignard, before assuming that office (or that office was renamed), was “Secrétaire d'Etat à la Maison du Roi”, from July 16 of 1789 (Philippe at http://tarotforum.net/showpost.php?p...5&postcount=56, confirmed at https://en.wikipedia.org/wiki/Fran%C...e_Saint-Priest). Card 4 is “minister of war”. The man on that card is most likely Jean-Frédéric de La Tour-du-Pin Gouvernet, who held the office of “Ministre de la Guerre” from Aug. 4, 1789, to November 16, 1790, and who was part of the same post-July 16 government as Guignard (and Jacques Necker, who would be the “finance minister” of card 54). Both he and Guignard had roots in Grenoble, a springboard of the Revolution. So the deck was likely produced sometime between July 16, 1789, and August 4, 1790. Guignard's connection is to Etteilla: The town of Saint-Priest, with its Saint-Priest family chateau, is located just outside of Lyon, where Etteilla’s disciple, attorney (and son of a local "sieur") Claude Hugand, lived. The “Prelate” (card 61) could be the Archbishop of Lyon. A stronger connection is to de La Salette and Grenoble; see entry 1794d. On a similar Russian deck but of 42 cards, see entry 1825. 1791a. Etteilla’s Nouvelle Ecole de Magie publishes a 4 page pamphlet every week from 1 Jan. To 27 March, then 4 more. Issue 1 is devoted to a plan for old-age insurance. Others are on administration, social insurance, and against the death penalty. No. 14 calls for abolishing taxes on playing cards, or at least divinatory ones, e.g. 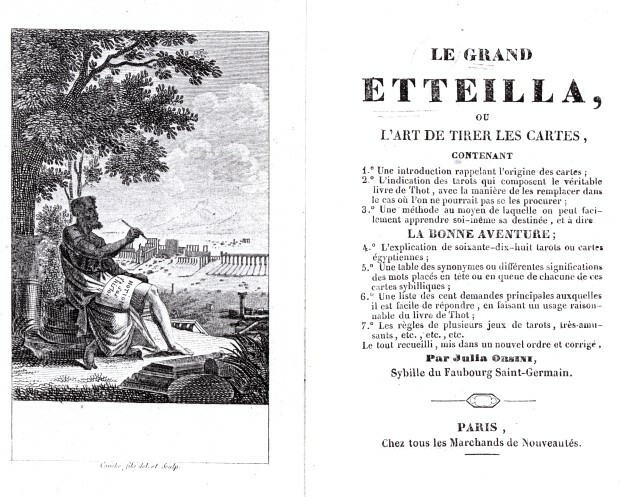 “the Book of Thoth, renewed from the Egyptian, and the Etteila, composed of 33 cards.” This last became known as the “Petit Etteilla”; the French card images are in the middle of each card and the keywords from Etteilla’s 1770 book above and below. For examples, many later reprints can be found under “Petit Etteilla” in Google Images. 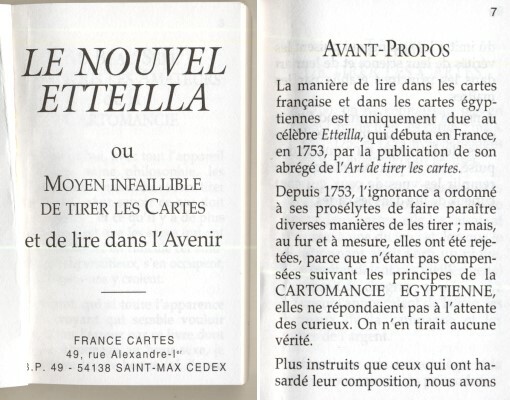 Etteilla also reissues (he says) his 1783 L’homme a projets, “proudly stating in its forward,” DDD report, “that he had foreseen the 1789 events some six years ago.” Another publication is Etteilla, ou l’art de lire dans les cartes/ (DDD p. 95f) (this is the booklet that is the basis for the 1751-1759 material above). 1791b. A card-maker named Lebouviet publishes 24 “Eteila” packs (DDD p. 96 and 274, note 61, which cites “Arch. Nat. (Paris), G2 185, file no. 16: “Etat des jeux controles et des produits operes pendant les premiers mois de l’annee 1791”) No pack with his name survives; but there is a 33 card pack “chez Etteilla, Rue de Bauvais, Paris” (DDD p. 96, and p. 274, note 62, now at the Bodlean Library, Oxford). http://a-tarot.eu/p/2012/tarots/sauveur-2.jpg and http://a-tarot.eu/p/2012/tarots/sauveur-6.jpg , from http://forum.tarothistory.com/viewto...grasset#p11735. There is also the undated 36 card pack with “Eteila” on four of the cards, see entry “c. 1789 or later”. 1791d. On 22 June. King and Queen of France are arrested following their flight from the Tulleries Palace, returned under guard. 1791e. On 30 Sept., in Vienna, is the premier of Mozart’s Magic Flute, an opera using Egyptian-style Masonic initiations. Hundreds of performances in the 1790s. It had been preceded by the collaboratively written Philosopher’s Stone of 1790. For more on this see http://forum.tarothistory.com/viewtopic.php?f=12&t=893 . 1791g. Dictionnaire synonymique du livre de Thot published anonymously (Decker, p. 197, says by Hugand in Lyon). The author is probably de La Salette. His name is mentioned as author of such a work by another student, de Bonrecueille. The author himself says he “lives in a village” and is “joined to considerable details related to the troops of whom I am in command.” In its “Preliminary discourse,” the author says that he was preceded “in the same undertaking” by another member, M. Jejalel (Hugand’s “Cabalistic” name). He also mentions that another member, M. de B., is occupied with the same task. That is likely de Bonrecuille (DDD p. 110). The core of the book, DDD says, is its ‘Table-des-synonymes de livre de Thot,’ pp. 19-57, following Etteilla’s order of the cards and their keywords. Timeline II, continued from preceding post. 1792-1808. 1792b. In August, King and Queen of France imprisoned. September, monarchy declared abolished. Sept. 21 is the beginning of a new calendar, "an I" of the French Revolution. 1793a. German translation of Cours théorique et pratique du livre de Thot, in Leipzig. (DDD p. 100). Also in 1793, per DDD’s dating (p. 113), an Etteilla deck with German keywords, elements, and days of creation, in script at top and bottom. Hand colored. The bottom keywords on the first 12 cards are printed right-side up. Card One has “Etteilla” and “Forschung” (Search) as keywords. Otherwise the cards are identical to the original 1789 deck, including the astrological signs and the extra numbers on cards 13-17. The publisher in Leipzig is Baumgärtner. For colored pictures of the first page, as well as the deck, which appears to have accompanied the book, see http://www.tarotforum.net/editpost.p...post&p=2802242 .) (Kaplan, vol. 2 p. 401, says erroneously that the designs are like the Lismon decks. Pictures of the cards are on his p. 402.) These cards are issued again in 1857 (DDD p. 114). 1793b. January 20, King Louis XVI executed. Committee of Public Safety takes power, instituting “Reign of Terror.” October, Queen Marie Antoinette executed. “1793?” 33 card pack (Petit Etteilla) published by “citoyen Saint-Sauveur” at “rue Nicaise, Section de les Tulleries, Paris.” DDD p. 274 n. 62: http://a-tarot.eu/p/2012/tarots/sauveur-6.jpg. citing Depaulis 1989, no. 98 and Keller 1981 no. FRA 191. Probably a misdating, see entry for c. 1797. 1794a. March. Hugand, under the name Jéjalel, is advertising his Course Complet: Théorique et Pratique du Livre de Thot ( Complete Course: Theoretical and Practical for reading the Book of Thoth). The book extends Etteilla's Cours Théorique et Pratique and unlike that one "is truly complete' (Decker p. 291 n20), It includes a list of synonyms (Decker p. 244). On p. 6 Hugand mentions that the Alexis from whom Etteilla learned about the Egyptian tarot was a "descendant" of the famous "Alexis Piémontese" (Decker, p. 191. Hugand also says (p. 72 of his book) that the name Jéjalel is from a Table of the 72 Cabalist Angels in the Zodiacus Vitae of Palingenius, where it is number 40; this is in contrast to its usual number, Decker says (p. 215), which is 58. (No such Table in either the French or the Latin editions of Palingenius that appear online. For more on this book, see the thread "Palingenio's Zodiacus Vita, 1535 Venice" at http://forum.tarothistory.com/viewtopic.php?f=11&t=854). 1794c. In July. Robespierre and other members of the Committee of Public Safety executed. 1794d. Marriage in Grenoble 15 Messidor an II (3 July 1794). Groom is Joseph Marie de Barral Marquis de Montferrat (Guignard de Saint-Priest's cousin: his father is the brother of Guignard's mother). The bride is Bibiane (?) Joubert de La Salette, the sister of Pierre-Joseph Joubert de La Salette, general, musicologist, Etteilla's pupil, and author of the Dictionnaire synonimique du Livre de Thot of 1791 (http://tarotforum.net/showthread.php?t=171379&page=7, post 69; with documents post 68). Both Pierre-Joseph Joubert de La Salette and Guignard were born in Grenoble, de La Salette in 1743 and Guignard in 1735 (https://fr.wikipedia.org/wiki/Pierre..._de_La_Salette, https://en.wikipedia.org/wiki/Fran%C...e_Saint-Priest). Also born in Grenoble (1727) was La Tour, the “minister of war” in the 1790 deck for Guignard (https://fr.wikipedia.org/wiki/Jean-F..._Pin_Gouvernet). 1796a. Saint-Sauver publishes Europe. Tome I, per announcement at http://a-tarot.eu/p/2012/tarots/sauveur-5.jpg . The address of the author is given as “rue Nicaise, maison de la section des Tulleries”. In the same year is his Encylopedia des Voyages, at https://books.google.co.uk/books?id=...auveur&f=false , at the same address, published by Deroy. It seems to be just about Asia. 1796b. L’Art de Tirer les Cartes, ou le Moyen de Lire dans l’Avenir (The art of reading the cards, or the means of reading into the future), with a treatise on interpreting dreams, and accompanied by a “jeu de cartes” (deck of cards), described in a 1796 review at https://books.google.co.uk/books?id=...%2C1068&edge=0. According to Depaulis (personal communication to Kwaw of 24 Dec. 2015) it is the same as the booklet published in 1791, except that the spelling “cartonomancie” has been changed to “cartomancie”. It is for use with a Petit Etteilla deck. No author given. Published by Deroy, at the address “librarie, rue du Cimitiere-Andre-des-Arts, no. 15”. The content as described in the review corresponds to that of the LWB that accompanies the current Petit Etteilla published by France Cartes. 1796-1797 (“An V”). Deroy publishes Le Tireur de cartes, ou le petit cartomancien. This is described in detail in DDD, p. 98. It is a "compilation of different methods of card-reading", with much borrowing from L’Art de Lirer dans les Cartes (of 1791 and 1796. The part on the Petit Etteilla is introduced by an editor who says he asked Etteilla personally if he could reprint “some folios that fell into his hands” in 1772, originally published 1771. Etteilla told him that he wrote it when he was 15 or 16 years of age. DDD estimate that this conversation would have been 1782-3, based on a program of projected works that this editor also reports: except for the Cahiers of 1793, they are unknown and reflect Etteilla’s troubles with the censors then. It is this “Petit Etteilla” thus introduced that DDD suspect is the Abrège of 1753. For the suspected identity of the “compiler” in “an V” see entry for 1797-1798, “an VI”. a mere copy (or a re-issue?) of these cards [first edition 1791 (see Wicked Pack, p. 96 and pl. 5)] appeared around 1797 under the name and signature of our dear friend "le citoyen Saint-Sauveur" (see Cary Coll., FRA 191; Les cartes de la Révolution 1989, n° 98). This is undoubtedly Depaulis’s new dating of the deck reported as “1793?” by DDD p. 274 n. 62: the other references are the same, no. 98 and FRA 191. It is also likely to be the same as a “1789-1804” Petit Etteilla deck at the BM, given with no images but the following description (omitting line separations). Incomplete piquet pack with 31 of 32 playing-cards for cartomancy (Etteilla), plus one extra card. Hand-coloured etching. Backs plain. Circa 1789-1804. Each card has in its centre a representation of a smaller card surrounded by various words and numbers. The pack has one extra card with "No. 1 Etteilla ou le Questionant" which bears the address "Chez le Cen. (citoyen) St Sauveur, Rue Nicaise...a Paris". Petit oracle des dames / Petit Etteilla' (both titles), later with "ou récréation du curieux" added, 42 cards, most double-headed, issued by Grasset de Saint-Sauveur, "A Paris, Chez l'Auteur, rue Nicaise Nr. 513. An cinquième / 1797", re-issued as 'Petit oracle des dames, ou récréation du curieux' in 1799 ("A Paris, Chez l'Auteur, rue Coq-Héron, Maison de France ; Deroy, libraire, rue Hautefeuille, n° 34, an VIII de la Rép. fr. [1799-1800]"); and reprinted later under the same or variant titles, notably by Gueffier, his widow and his son’. Depaulis offers no evidence, but this conclusion is suggested by the address of the author, that of Saint-Sauveur at rue Nicaise in 1797 (compare to other entries for Saint-Sauver: c. 1797/“1793?”, 1796a, 1797b) changed to rue Coq-Héron by 1799 (see entry for Dec. 1798/Jan. 1799. Argued at http://www.tarotforum.net/showpost.p...&postcount=358 andhttp://forum.tarothistory.com/viewto...&hilit=grasset. It is not clear what booklet accompanies the deck. [b]1797b. Date suggested for an "Oracle des Dames", without "Petit". See http://tarotforum.net/showpost.php?p...9&postcount=12 and after, and links there. 1797-1798 (“an VI”) Petit Escamoteur, by “citoyen” Saint-Sauveur, rue Nicaise, Section de les Tulleries, Paris, http://a-tarot.eu/p/2012/tarots/sauveur-6.jpg. 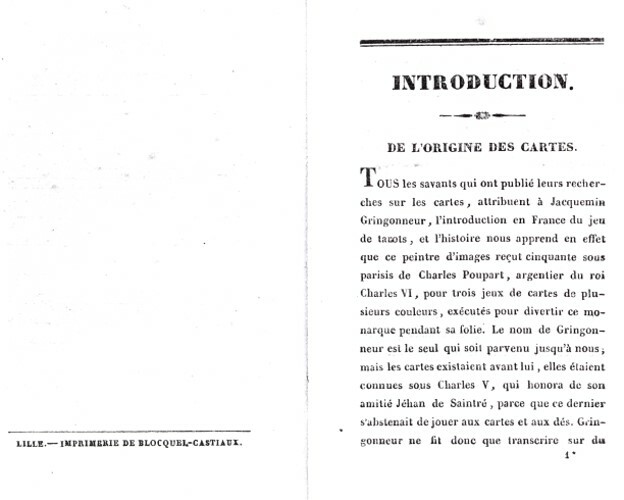 Published in “an VI” (1797-1798), with Le Tireur de cartes, ou le petit cartomancien (first seen the previous year), but now with the publisher’s address that of Pigoreau (DDD p. 274, note 65). So it may be that the author of both “Escamoteur” and “Tireur” are written, or at least compiled, by Saint-Sauveur. Dec. 1798/Jan. 1799. Saint-Sauveur publishes Tableau des principaux peuples de l’Europe, de l’Asie, de l’Afrique, & de l’Amerique, & les decouvertes des capitaines Cook, Laperouse, Wilson, etc., according to an announcement in Journal général de la littérature de France, Volume 2 of “Nivose an. 7", i.e. Dec/Jan 1798/1799. Saint-Sauveur’s name is listed, followed by the address is “chez l’auteur, rue Coq-Heron, maison de France, derriere de la Poste aux Lettres”. The announcement is at https://books.google.de/books?id=QwQ...%A9ron&f=false. One tableau is shown at http://www.dsloan.com/Auctions/A22/i...a-grasset.html. Google Books has the book at https://books.google.co.uk/books?id=...page&q&f=false The BnF has the text, or a variaton, at http://gallica.bnf.fr/ark:/12148/bpt6k1158445/f388.item (from http://www.tarotforum.net/showthread.php?t=249390 ). The BnF and Google Books’ title page has, besides the Coq-Heron address, also “a Bordeaux, chez la citoyenne Saint-Sauveur, sous le peistile de la grande Comedie”: http://gallica.bnf.fr/ark:/12148/bpt...t-sauveur.zoom The date is “An VI”, i.e. Sept. 21, 1798-Sept. 21, 1799. 1798. L’Art de Tirer les Cartes, ou le Moyen de Lire dans l’Avenir, the 1796 in a new edition, including the treatise on interpreting dreams, but now with an application to the Lottery (http://www.livresanciens.eu/anciens/...tems/20048.jpg). This would seem to be an expanded version of the 1796 publication and not merely a reprint, since the other did not appear to have an application to the lottery. A “c. 1800” book described in DDD pp. 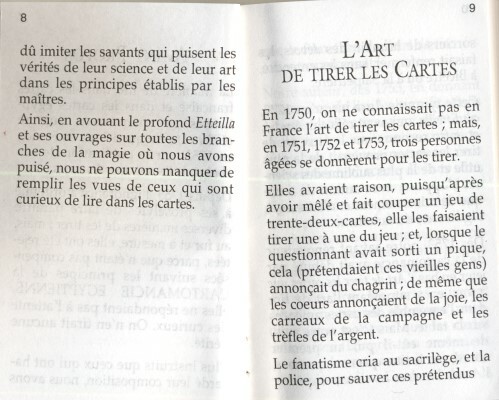 274f note 64 as a reprint of the 1791 “Etteilla, ou l’Art de lirer les cartes..” with the spelling “cartomancie”, is either this one or the 1796 (DDD do not give the full title, so it is impossible to say which they mean). The application to the lottery would seem to be the numbers appended to the dream symbol entries, as shown in the 1809 booklet at http://www.tarotforum.net/showthread.php?p=3091451. 1799. Napoleon’s expedition to Egypt, which includes artists and scientists. Upon his November return, he becomes First Consul of France in a coup. Proclaimed Emperor in 1804. 1800, Jan. 19. Advertisement for booklet called Petit Oracle des Dames, ou recreation du curieux in Paris, with accompanying cards, “42 tableaux, often double, joined with ordinary cards”, .This is in the Journal Typographique et Bibliographique for “30 Nivose, An 8”, i.e. 19 Jan., 1800, on p. 115: https://books.google.de/books?id=KW4...0dames&f=false No author given, but the first address listed, "rue du Coq-Héron, maison de France et chez Deroy, rue Hautefeuille, No.34" is the same as for a publication of Saint-Sauveur (https://books.google.de/books?id=QwQ...%A9ron&f=false . The second is of the publisher Deroy. (See http://forum.tarothistory.com/viewto...grasset#p11735) For the modern Grimaud edition of the 42-card “Petit Oracle des Dames” deck, see the first two posts of http://tarotforum.net/showthread.php?t=171379. For an 1841 reprint of what is presumably still the same booklet, see http://gallica.bnf.fr/ark:/12148/bpt...te.langEN.zoom. For discussions of the philosophy behind the sequence, see http://www.tarotforum.net/showthread...=171379&page=2, post 18 and continuing on to p. 3 of the thread, picking up again at http://www.tarotforum.net/showthread...=171379&page=4, post 34 to the bottom of the page. c. 1800a. DDD p. 143 mention a “Petit Oracle des Dames” published by "Mme. Finet", with 36 cards. DDD’s references (footnote 3, p. 282), are Depaulis, Les Cartes de la Revolution 1984 no. 1321984, Hoffmann & Kroppenstedt, Wahrsagencarte 1972 no. 68; Hoffmann and Dietrich Tarot - Tarock – Tarocchi 1988 no. 105; and Depaulis Mademoiselle Lenormand 1989, nos. 100, 101, and 102. This would seem to be a different book and game from Petit Oracle des Dames, ou recreation du curieux, given the difference in the title, and that it is for a 36 card deck, 32 piquet cards plus 4 “Etteilla” cards. The cards are probably the same as given in “c. 1789 or later” entry above. c. 1800b. A "Grand Jeu de Geographie" produced, similar to Saint-Sauver's geographic deck of "c. 1789 or later". See http://tarotforum.net/showpost.php?p...2&postcount=33. Pierre-Charles-Augustin Gueffier, d. 1803/4), was succeeded by his widow, the Veuve Gueffier, who died in 1809 (a probate inventory is in our Archives Nationales), then by their son Gueffier jeune no. 2 (or Gueffier fils), who bought the remaining stock of Etteilla's books in 1817, and later (1823) sold Le Petit Oracle des Dames and Le Veritable Etteilla to Philippe-François Peytieux. 1802b. Fleischer also lists a “Petit Necromancier, ou le Tireur de Cartes...”. Address is in Bordeaux, that of Saint-Saveur’s engraver Labrousse, or perhaps of Saint-Saveur at that time; see http://tarotforum.net/showpost.php?p...30&postcount=1 . This could be a reprint of the 1796 publication, or of any other using 33 or 36 cards. 1802c. An Albert D’Alby publishes “L'Oracle parfait, ou nouvelle manière de tirer les cartes, au moyen de laquelle chacun peut tirer son horoscope”, online at https://books.google.de/books?id=nmV...gbs_navlinks_s and discussed at http://tarotforum.net/showpost.php?p...30&postcount=1 Mentioned by DDD p. 146 and note 8, p. 282. It will be part of the inventory of Gueuffier, documented in 1824 (http://tarotforum.net/showpost.php?p...&postcount=333 ) It is claimed that the book was approved by the censor in 1788, but difficulties prevented publication then. It uses three 36 card decks, each 32 + four special ones. 1804. D’Odoucet publishes vol. 1 of Sciences des signes, ou médecine de l’esprit, connu sous le nom d’Art de tirer les cartes; it is similar to Etteilla’s Cours théorique et pratique. (DDD p. 106). 1805. Dec. 2. Battle of Austerlitz, Napoleon’s greatest military victory, defeating a combined Austrian-Russian army. c. 1806. (Between July 1806 and August 1807, per DDD p. 107; but Philippe [http://www.tarotforum.net/showpost.p...7&postcount=9] justly points out that the terminus is unjustified. Between July 1806 and Dec. 1808 is the most that can be said, the period in which the dedicee, if it is Talleyrand as universally believed, had the titles d'Odoucet gives him). D’Odoucet publishes Vol. 2 of Science des signes. This includes woodcuts of all the cards. (If he used woodcuts, he must not have had access to the original copper plates.) Philippe has posted the first two at http://www.tarotforum.net/showpost.p...&postcount=292, and all of the first 21 tarot cards at https://www.flickr.com/photos/315159...57662037222321. (These last at http://www.tarotforum.net/showthread...doucet&page=31.) The full title is Science of signs, or mind medicine, colloquially known under the name of card reading; containing the literal and philosophical meaning of the hieroglyphs and inscriptions of each sheet of the book of Thoth, their synonymous, homonymous, and numerical relationships, embellished with 78 woodcuts. Second Part. 1806a. Example of Petit Etteilla with 32 + 3 extra cards, published by Mme. Gueffier, at http://www.britishmuseum.org/researc...tteilla&page=1 The extras are Questionant, Questionnante, and one in color of Etteilla in a giant conical hat surrounded by magical paraphernalia. Sample pages are on view, including the manner of drawing cards and the interpretation of dreams. Lottery numbers for the years 1788 and 1789 are provided. 1806b. Veuve (Widow) Gueffier publishes 82 page Le petit oracle des dames, ou Récréation du curieux... / (par Alliette), with 42 coloured cards for Le Petite Oracle Des Dames, as listed in the 1806 Journal General de la Litterature de France (https://books.google.com/books?id=ii...effier&f=false ; also “Le Veritable Etteilla, ou l’Art de Tirer les Cartes, same link, brochure with 33 cards, including dream explications and applications to the imperial lottery. (found by Kwaw at http://www.tarotforum.net/showpost.p...&postcount=316). c. 1807. Date Kaplan gives for another "Petit Oracle des Dames", not colored, now in pieces with titles removed. Dogs face different direction than in the other. See http://www.tarotforum.net/showpost.p...&postcount=394 and the one after. 1808. D’Odoucet is in Lille in November 1808, and there is no further trace of him (DDD, p. 106). Lille is where Blocquel and Casteaux start up their business in 1809 (from Cerulean, http://www.tarotforum.net/showthread...4546&page=2%29), citing Roger D.J. Collins, Journal de la Societe des oceistes. n. 81, 1985, pp. 235-240. Imperial decree now requires the licensing of printers. DDD observe that D'Odoucet is not among the Paris printers that were approved in the regulations in 1811. Part 4 of Timeline II, from preceding posts. 1809-1829.
c 1810. This is when DDD p. 144, date the “Nouvel Eteila, ou le Petit Necromancien” produced by publisher Robert. They cite in note 5 p. 282 Depaulis 1984, no. 133.. Depaulis now says 1820, for which see that entry. Uses eight of Etteilla’s tarot figures DDD say. Images are the same as in “1789 or later” entry for “Mme. Finet”. 1814. Marie Anne Adelaide begins publishing under pen-name Mlle. M.A. LeNormand (http://books.google.com/books?id=0ds...page&q&f=false). These books recount clairvoyancy rather than a method to read cards, but did much to popularize fortune-telling, including with cards. Etteilla followers did not hesitate to associate themselves with her; the author of the 1838 book listed below, for example, is called “la Sibylle du faubourg Saint-Germain,” a Lenormand epithet (DDD p. 147). 1814. Napoleon exiled to Elba, Louis XVII installed as King of France. Napoleon escapes in 1815. Defeated at Waterloo, he is exiled to St. Helena Island, dying there 1821.
c. 1815. 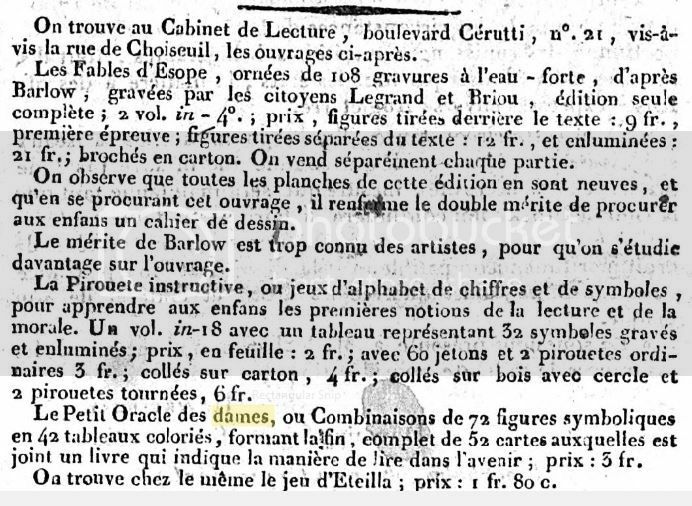 Date Kaplan estimates (but also saying “early 19th century”) for a version of the Petit Oracles des Dames he has (Encyclopedia vol 1 p. 157), with 82 p. booklet. Images at http://www.tarotforum.net/showthread.php?p=3041148 . These are half-cards that have been cut and re-arranged. 1817. Feb., Gueffier jeune acquires the remaining few examples of the Book of Thoth, published by Etteilla, consisting of several volumes and a deck of 78 cards with symbolic figures (http://www.tarotforum.net/showpost.p...&postcount=320). Livre du Thot, a 4 in 1 volume. Du Dictionnaire synonymique du livre de Thot (In a 1827 listing, Petieux has the rights to this). The acquisition is published under a notice of a transfer of funds (Mutations de Fonds), implying the acquisition of commercial rights (including e.g. publishing rights). c. 1820a. 52 card version, plus a blank, of “Jeu divinatoire géographique”, originally a 32 + 1 card deck, which is at http://www.metmuseum.org/collection/...%89trangers%27. The 52 card version is referenced in lot 50 of Cartes a Jouer et Tarots: Collection Claude Guiard, Samedi 5 Novembre 2011, Millon, Maison de ventes aux Encheres, Paris. Some cards are based on illustrations in the 1797-1798 work of St-Sauveur (see entry 1797-1798) according to comments in an auction catalog of Nov. 2011 posted by Kwaw (“figures of folk are inspired by the paintings of the main plates of peoples Europe, Asia, Africa, America ... by Jacques grasset st-savior (Paris, Year VI)”, at http://www.tarotforum.net/showthread...52#post4540263). Cards have on them what appear to be lottery numbers and divinatory expressions. The aces present moral allegories, with designs that overlap with the c. 1790 cards. http://www.tarotforum.net/showpost.p...&postcount=342. This device of having people in folk costumes in a deck with allegorical cards had already been used by Poilly in his Minchiate Francesi (c. 1660), with representatives of the four continents as court cards (see http://www.tarotforum.net/showthread.php?t=249390). The “Amour” of these decks is very similar to that in the Poilly decks (and to other pre-1820 “Amour” cards). c. 1820b. Card-maker H. Pussey “flourishes”, according to the BM at http://www.britishmuseum.org/researc...x?bioId=159403. The BM has an example from “c. 1820” of a Pussey Petit Etteilla at http://www.britishmuseum.org/researc...tteilla&page=1, showing the suit of clubs. 6 of the 8 cards have the upright Etteilla meanings. 2 are different. No reversed meanings; insteadm the card has an illustration relating to the keyword. 1820a. Robert’s “Nouvel Eteila, ou le Petit Necromancien” listed in March 1820 Bibliographie de la France, 36 cards, 32 plus four “consultant” cards, all with a scene, identical to cards at “c. 1789 or later” entry, but that there are no small images of playing cards in the lower corners. 1820b. Gueffier jeune. rue Bourtebourg no. 12 (?) republishes Etteilla’s Zodiac mysterieux. online at http://gallica.bnf.fr/ark:/12148/bpt6k622696.r=Etteilla. 1820c. Book Le veritable cartomancie, by Louise Amron, Paris 1820, according to p. 79 of Il Tarocchino di Bologna: Storia, Iconografia, Divinazione, by Andrea Vitali and Terry Zanetti. This last book have a picture from it giving divinatory meanings for the Ace, King, Queen, Jack, 10, 9, 8, and 7 of Diamonds, plus the Consultant card, so a piquet deck plus one, as is the Petit Etteilla. Many of Amron’s divinatory meanings derive from Etteilla's Petit Etteilla, but using Etteilla's reversed meanings and combinatory meanings simply as additional meanings. Other meanings are borrowed from the Grand Etteilla (for courts); some seem not derived form Etteilla. Amazon.fr has this entry: "La Véritable Cartomancie expliquée par la célèbre sibylle française, mise en tableaux par l'héritière de Melle L. Norma, savante cartomancienne du XVIIIe siècle. Nouvelle édition"... Signé Louise Amron. Published 1898. BnF lists only a 1975 reprint. 1823. M. Peytieux, “libraire, passage du Caire, n.121, à Paris”, purchases the rights and remaining stock of Le Petit Oracle des Dames & Le Veritable Etteilla from Gueffier jeune. This firm has been in existence at least since 1798 (https://books.google.co.uk/books?id=...2%2C253&edge=0 , described at http://tarotforum.net/showpost.php?p...&postcount=322 . 1824a. In January Peyteux changes his address to “gallerie Delorme”, a possible connection to a later firm called “Delorme”. http://tarotforum.net/showpost.php?p...&postcount=333 .This post also documents “Mutations des Fonds” between Gueffier and Peyteux. 1824b. Mme. Finet “Nouvel Eteila” printed or reprinted per Depaulis’s personal communication to Kwaw of Dec. 24, 2015, reported at http://tarotforum.net/showthread.php...24#post4547267. However in an 1824 book what is advertised "chez Mme. Finet" is a "Grand Eteila [sic], ou l'art de tirer les cartes", 32 cards, and a "Petit Eteila, ou le Necromancien des dames", 36 cards with allegorical scenes. but no "Nouvel Eteila" as such:: http://www.tarotforum.net/showthread...122602&page=40. See also “c. 1789 or later” entry, above, and c. 1840, below. 1825. In Russia, a 42 card deck similar to the c. 1790 France 66 card deck is produced, of which 41 seem to have survived: https://picasaweb.google.com/1045543...eTelling1825#; also at http://a.trionfi.eu/WWPCM/decks05/d02370/d02370.htm. See comparisons at http://www.tarotforum.net/showthread.php?t=248520, posts 6-9, discussed further in post 10. 38 of the cards are similar to cards in the first 42 of c. 1790, and 2 others are on similar themes as cards in c. 1790. The "Minister" cards are not in the 1825. The deck might be related to Guignard’s second son’s career in Russia, where he fought against Napoleon and married a Russian princess (before 1805), returning to France in 1822 (https://en.wikipedia.org/wiki/Armand...e_Saint-Priest). 1826. Pierre Mongie l’aine (the elder) publishes Etteilla’s tarot deck (Grand Etteilla I) from the original copper plates, but altered to erase the astrological symbols in the corners. To most of the trumps, court cards and Aces, it adds new titles in cursive script, inside the picture frame, of a Masonic or Biblical flavor, such as “Hiram’s Masonry” for card 2 or “Solomon” for card 8. On card 1, instead of “Etteilla” and “Questionnant” it has “L’Homme qui consulte” both top and bottom (Kaplan vol. 2 p. 400f). There is also a book, The art of reading cards and tarots or French, Egyptian, Italian and German Cartomancy. The author, given as “Aldegonde Perenna, Polish sibyl,” is actually Gabrielle de Paban, cousin of editor and collaborator Collin de Plancy. In an introductory essay, de Plancy says that the 1200 pages of Etteilla’s two large volumes contain nothing but astrological fantasies; the present work, by contrast, is at least clear. Its section on “Egyptian tarots” was reprinted numerous times by Grimaud to accompany its reprints of Etteilla’s deck (DDD pp. 144-147). Its 1969 deck, which showed keywords in both English and French, offered an English translation of this booklet, 118 pp. 1827. Gueffier jeune is still listed as selling the Grand Etteilla, consisting of several volumes and deck for 36fr, or 9fr for the cards alone (http://www.tarotforum.net/showpost.p...&postcount=320), but this is the last year found for either Gueffier jeune or Peytieux. Part 5 of Timeline II, from preceding posts. 1830, July Revolution in Paris establishes constitutional monarchy, with election of Louis-Philippe as king. 1838. Simon Blocquel publishes a new version of Etteilla’s deck, inserted as engravings in a 212 page book, Le Grand Etteilla. Art de tirer les cartes et de dire la bonne aventure, authored by one “Julia Orsini” Opening pages are at http://1.bp.blogspot.com/-Uoh9aHHdyC.../titlepage.jpg, http://2.bp.blogspot.com/-H-n884oVKG...ontispiece.jpg, and http://2.bp.blogspot.com/-KLyUHwnsgL.../firstpage.jpg. Published “chez Delarue, Libraire, Quai des Augustins, 11” in Paris, and “chez Blocquel-Castiaux, editeur” in Lille. Delarue is Blocquel’s son-in law. Blocquel and Castiaux habitually used "anagrammatic synonyms such as Blismon, Z. Lismon, Zlismon, Buccellos, Milbons and Monblis" (DDD p. 147). Another reference is at http://gallica.bnf.fr/ark:/12148/bpt...=Etteilla.zoom. This name is known as that of Pope Alexander VI’s mistress, c. 1500. DDD (p. 147) say the "Orsini's" date of publication is “1838 or a trifle earlier.” But Kwaw gives an 1838 source listing the book (https://books.google.co.uk/books?id=...Orsini&f=false, as well as another book, from 1843-1857, giving the publication date of the book as 1838 (see http://www.tarotforum.net/showpost.p...&postcount=274). Besides including engravings of the cards, the book contains explications of all the cards, four ways of doing readings, a list of typical questions that the cards will answer, an account of the game of tarot (not a reprint of the 1659 Règles), and a long section of “synonyms and alternative meanings,” presumably derived from de la Sallette or D’Odoucet. It uses the term “Questionnant” rather than “Consultante.” The deck, a “Grand Etteilla II” in the current classification of Etteilla decks, is produced by “Z. Lismon”, another pseudonym. Card titles are printed on both sides of the picture frame. Some images and keywords are different from Etteilla’s original deck (now called the “Grand Etteilla I). The Ace of Batons puts Etteilla’s reversed keyword on top (Chute) and vice versa (Naissance). For a comparison of I, II, and III, for the first four cards, see http://etteillastrumps.blogspot.com/...cards-1-4.html . The other trumps come later in that blog. An example of a printed Lismon deck is at http://www.britishmuseum.org/researc...18&page=1.They date it to 1800-1850, but there is an advertisement for the “Grand Jeu de l’Oracle des Dames” next to the title page, suggesting a post-1856 dating (see entry for 1856). c. 1840. Date estimated for "Finet" “Nouvel Eteilla/Petit Cartomancien’ by Cary Collection, FRA 194 and FRA sheet 176; http://tarotforum.net/showpost.php?p...&postcount=331 and http://tarotforum.net/showpost.php?p...&postcount=337 . See “c. 1789 or later” for more cross-references..
1840. Baptiste-Jean Grimaud arrives in Paris at age 23 (Corodil at http://www.tarotforum.net/showthread...93#post2110993, drawing on an article in the review "As de Trèfle"). In 1848, Grimaud buys the workshop of cartier Arnould (http://www.france-cartes.fr/). In 1851 he forms the société Grimaud & Cie. with two partners, and in 1858 signs a contract with inventor Firmin Chappellier so as to print cards industrially, making cards with rounded metallic corners (see Corodil). This firm will be one later known for its reprints of Etteilla decks and booklets. Grimaud is still allowed to say the firm started in 1748 (and does so on numerous Marseille-style 2 of Coins), but there aren't really any cards bearing the Grimaud name before 1851, or machine-made Grimaud cards before 1858. (Kaplan, vol. 2 p. 203 and 211, is to that extent wrong when he says "...B. P. Grimaud, begun in 1748". The "1748" date is important because after 1817, government regulations in France greatly limited firms' access to the market, in effect creating a closed market (marché fermé), a situation which lasted until 1945 (http://www.france-cartes.fr/). 1841 or earlier. Reprint of both Le Nouvel Etteilla, ou Moyen infaillible de tirer les cartes et de lire dans l’avenir par l’interpretation des songes. and Le Petit Oracle des Dames, ou Recreation du curieux, by de Ducessoir – “A Paris, chez les marchands de nouveautes”. http://www.tarotforum.net/showpost.p...&postcount=316 . A deck of the Petit Oracle des Dames with 42 cards, “early 19th century” according to the British Museum (http://www.britishmuseum.org/researc...61488&partId=1), shows a snippet of its accompanying booklet, Le Petit Oracle des Dames, ou Recreation du curieux It is identical in text typeface and pagination to that of the same title published by Ducessois (1841 or earlier), at 55 Rue des Augustins, http://gallica.bnf.fr/ark:/12148/bpt...te.langEN.zoom. When the same comparison is made with the 1807 booklet, the words are the same but the layout on the page is not. This may suggest that the BM deck is 1841, since before then the books and plates were simply acquired each from the publisher preceding. 1843. “Jeu de la Princesse” deck appears as book illustrations (DDD p. 150). Designed by Lorambert, it is an Etteilla style deck in which some of the designs are more Egyptian looking than his. The titles are at the bottom of the cards, as in the Marseille. Some titles are taken from the 1826 deck. The book is reprinted in 1850. A deck appears in 1864, with many titles changed to more Egyptian ones, such as “King Thoth” and “Anubis”; the deck as a whole is the “jeu de la Princess. The accompanying book says that Princess Tarot was a great prophetess of Thebes and Memphis. The deck is then put out by Charles Watilliaux, whose firm was active 1874-1908. (DDD p. 150). Besides Dusserre’s 1983 reprint, there is one called Cartomanzia Italiana put out by Edizioni del Solleone in 1983 (http://www.tarotpedia.com/wiki/Cartomanzia_Italiana) and one by Lo Scarabeo (http://www.learntarot.com/eadesc.htm). 1848. 2nd Republic established in France, electing Louis Napoleon as President. 2md Republic becomes 2nd Empire in an 1852 coup, with Louis Napoleon, nephew of Napoleon I, as Emperor Napoleon III. 1850-1890 The BnF has a "Grand Etteilla" dated in this range, published by Delorme. See http://gallica.bnf.fr/services/engin...#resultat-id-1. It is a stenciled woodcut version of the "Grand Etteilla II" deck. The same Gallica search (“Delorme Etteilla”) turns up a Grand et Petit Etteilla, ou l’Art de tirer les cartes, donnant, etc. at “Paris, chez Labailly, quai des Augustins 27” in the Bibliographie de France for 1849..
c. 1853. L’art de tirer les cartes by “Julia Orsini.” appears with this date in the bibliography of Tarot of the Bohemians as translated by A.E. Waite., 2nd and 3rd editions). The “explications” section of this book is the basis of (but not identical to) the LWB to the current Editions Dusserre Tarot Egyptien: Grand Jeu du Oracle des Dames deck, even though that deck’s pictures often do not fit the descriptions in the book. The Dusserre deck is a “Grand Etteilla III,” while the book was written for a “Grand Etteilla II.” Editions Dusserre provides an English translation on facing pages; its total number of pages, including both English and French, is 112. 1856. Publication of Tarot Egyptien: Grand Jeu du Oracle des Dames, 78 cards, per DDD p. 149 designed by G. Regamey, originally printed by chromo-lithography by Hangard-Mauge, published by firm of Delarue (Blocquel’s son-in-law). DDD give 1867 as the date for this data. Kwaw (http://www.tarotforum.net/showpost.p...&postcount=273) finds that the BnF gives their copy a date of 1856 and shows it advertised in Feuilleton du Journal de la Librairie for 5 July, 1856 (http://gallica.bnf.fr/ark:/12148/bpt...des%20dames%22). It is an Etteilla deck with the same keywords and titles as the “Grand Etteilla II”, but with many of the trump figures derived from the 15th century Nuremburg Chronicle. This style of deck is generally referred to as a “Grand Etteilla III”. The accompanying booklet is called [i’Les Récréations de la cartomancie ou Description pittoresque de chacune des cartes du grand jeu de l'oracle des dames, avec des combinaisons pour expliquer le présent, le passé, l'avenir,[/i] by Mlle Lemarchant ["sic"] published “Paris : tous les marchands de nouveautés”. A photocopy is in Google Books (first entry at https://www.google.com/search?q=Les+...utf-8&oe=utf-8), dating it to 1850. However at the end of the booklet there is an advertisement for a book showing how to address petitions to His Majesty the Emperor. This would be Napoleon III, who assumed that title in Dec. of 1852. These advertisements also state that the cards themselves were published with the booklet, using the relatively new (invented 1837, per Wikipedia) technology of chromo-lithography. The text appears to be a radical revision of the “Julia Orsini” explications; the descriptions of the cards fit the new pictures. 1870, July. Napoleon III deposed after French defeat in Franco-Prussian War. 3rd Republic established, which lasts until 1939. 1880-1890 – An H. Pussey Grand Etteilla I is dated by the BnF as 1880-1890 (http://gallica.bnf.fr/services/engin...tteilla%22%29# , number 1). In that the body of water on card 3 is green rather than Grimaud's blue, it is much like a deck dated by Associazione Le Tarot as "beginning of the 19th century" http://www.associazioneletarot.it/page.aspx?id=233#; but this dating is not secure. The BM's card 3 has blue water. c. 1890. At the BnF is also a Grand Etteilla I published by "Grimaud et Chartier", c. 1890 (see link in “1880-1890” entry, number 3, with “ancienne fabrique” [former factory] as Lequart et Mignot). 1890 - “the company Grimaud increased considerably her catalogue with several divinatory games thanks to the purchase of the companies Pussey then Lequart et Mignot. From the first (company), she borrows the Sybille des Salons, the Jeu de la main and the Grand jeu de Mlle Lenormand; and from the second (company), Le Destin Antique, the Grand and the Petit Etteilla, the Petit oracle des Dames and the Petit Cartomancien.” From article in As de Trefle translated by Corodil, http://www.tarotforum.net/showpost.p...&postcount=288 The implication is that 1890 is when Grimaud started publishing the Grand Etteilla I. 1890-1917. The tax stamp abolished in 1790 for playing cards returns in 1890, lasting until 1917 (Kaplan vol. 2). However the absence of a stamp does not always mean that the card is before 1890. Examples of Etteilla decks with this stamp are at https://www.flickr.com/photos/sumada...634144383225/: two lithographed Etteilla IIIs from Delarue, a Grimaud c. 1890 Etteilla I at https://www.flickr.com/photos/sumada...57631583898258 , a Pussey c. 1900 Etteilla I at https://www.flickr.com/photos/sumada...57631580703610. He also has a Lismon Etteilla II at https://www.flickr.com/photos/sumada...57631592690647 and another Etteilla II, unknown date, at https://www.flickr.com/photos/sumada...th/8007336948/, The Lismon of this vintage included an abridged version of “Julia Orsini’s” c. 1838 explications. Grimaud used the “Egyptian” part of the 1826 book, 168 pp. 1903. “Dr. Moorne”, Los maravillosos secretos de los naipes. Arte completo de echar las cartas. Segun el sistema egipcio de 78 Taros y los metodos mas usados y conocidos en Francia y en Espana (The wonderful secrets of the cards. The complete art of laying the cards. According to the Egyptian system of 78 Tarots and the most used and known methods in France and Spain.) Madrid, 1903, 272p., 19.5cm. Published by Pueyo (Kwaw’s source: Gregorio Pueyo (1860-1913): librero y editor by Miguel Angel Bull Pueyo. p.126). “Dr. Moorne” was pseudonym of Francisco Moreno (full name Francisco Teodomiro Moreno Durán, b.30th July 1864, d.1933). Other pen-names were Dr. Morral, Mateo, Bachiller Francisco de Estepa (Sevilla). 1909. Papus publishes Le Tarot Divinatoire (now available in English as The Divinatory Tarot, which includes the Etteilla lists of synonyms and alternative meanings, but keeps the Marseille order of the trumps. He says that his lists come from Etteilla and D’Odoucet. (Papus’s book also has other interpretations, Paul Christian’s and his own.) The illustrations are of Papus’s own design. 1910. A. E. Waite draws extensively from the Etteilla School’s word lists in his Pictorial Key to the Tarot, less systematically than Papus, but still around 30-50% of the time, and without giving Etteilla credit (see http://www.villarevak.org/td/td_1.htm). Judging by certain choices of words, Waite’s source would appear to be the c. 1853 “Julia Orsini,” the one in the bibliography he provided for Papus’s Tarot of the Bohemians. c. 1945. Simon and his firm France Cartes purchase Grimaud, continue to put out the Grand Etteilla I and its old LWB. 1946. France establishes the Fourth Republic. Fifth Republic 1958. Post-1945 to today. At some point Dusserre re-issues the Grand Etteilla III as, but with an LWB appropriate to the Grand Etteilla II. (It is a version, perhaps the 1853, of that by “Julia Orsini”, but omitting the “synonyms and other meanings” that Waite and Papus found so useful.) This LWB still fits, because the keywords of the Grand Etteilla III are the same as those of the Grand Etteilla II (which are also mostly Etteilla’s). It is only the references in the LWB to the pictures that don’t work. 1969. France Cartes/Grimaud puts out the Grand Etteilla I with original French keywords and fairly accurate English translations on the cards. The LWB is the same as in c. 1865, except that they now have an English-only version. 1977 to today. France Cartes/Grimaud’s Grand Etteilla I changes many of the keywords on the cards; it also changes the “significations” given in the LWB (without mentioning the keywords); examples of the new language (largely not Etteilla's) are at http://etteillastrumps.blogspot.com/. English and French are in the same publication This deck and LWB continue to be put out, although its language is poorly correlated with anything Etteilla wrote. Only the pictures are mostly the same. "1804. D’Odoucet publishes vol. 1 of Sciences des signes, ou médecine de l’esprit, connu sous le nom d’Art de tirer les cartes; it is similar to Etteilla’s Cours théorique et pratique. (DDD p. 106). (Per Philippe, http://www.tarotforum.net/showthread...93#post4529349, it is 1793.)" In fact D'Odoucet's vol 2 (in which the tarot is reproduced) was published between June 1806 and December 1808. I'm sure of it because of the dedication. I wrote 1793 as I thought (perhaps wrongly) that the Grand Etteilla was first published at this date. Another thing intrigues me. Dummett Depaulis and Decker are the only ones to give the 1 march 1738 as Etteilla's birthdate. Even Millet Saint-Pierre doesn't mention it. Is this "burial certificate" shown in the book A wicked pack of cards ? I've not been able to find it anywhere and moreover it was extremely rare at that time to see the birthdate registered in a burial document. What you say about vol. 2 disagrees with DDD, p. 107) who say that the book had to have been published "before 19 August 1807, when Napoleon suppressed the Tribunat whose palace (previously known as 'Palais Royal', then 'Palais-National') appears in Surosne's address (as Palais du Tribunat)." Looking in the previous pages, I do not see anyone named Sorosne mentioned and I have no idea who he is. They agree that it was published after June 1806, because of the dedicee. The burial certificate does not say March 1. It says he was age 53 at the time of death (8 pm on 12 Dec. 1791, to be precise). They cite the Paris Archives, V2E10639, 12.12.1791. March 1 comes from his own account, at the end of Zodiac Mysterieux, they say. I should add that I sent copies of the timeline beforehand to Huck and Kwaw for review. Huck saved me from at least one egregious error/confusion and a couple of petty irrelevancies. Kwaw had year-end events but is going through it now, he says. There is a copy of Etteilla's astrology chart in a collection of papers called 'Etteilla's Ephemeris' which I saw referenced a few weeks ago but can't recall where at the moment - I think it was in the Cary-Yale collection... (it was not viewable). Between Dawn and Sunrise March 1st will probably make his ascendant and sun sign the same (Pisces). Sunrise is about 7.30 LMT March 1st at Paris - not sure off the top of my head how long the difference between that and dawn would be at Paris... The brightest period (civil dawn, with the Sun between 6 to 0 zero degrees to the horizon, when artificial light may no longer be needed), would be between 7 - 7:30. The longest period (astronomical dawn) would be much earlier, from about 5.45 to 7:30.